Rocco Mastrangelo typically likes to mingle among his patrons in Cafe Diplomatico, a Little Italy sports bar in Toronto that his father opened in 1968. But during overtime in last year’s Euro final between Germany and Italy, he and his wife Connie retreated to the restaurant’s office to kneel and pray between nail biting penalty kicks. "The crowd was so in pain. It was like a funeral out there," says Mastrangelo. "Monday was the same." Once a quadrennial, soccer enthusiasts spill onto the streets outside overflowing sports bars across Canada like Cafe Diplomatico. Chief among them are throngs of blue-clad fans sporting the distinct Azzurri soccer jersey—a symbol of pride for Italians everywhere thanks to the team’s impressive record. Italy has won four of 20 World Cup tournaments, they’ve been in six final matches, and qualified for nearly every tournament in history. But come next summer when the tournament takes place in Russia, those crowds will have the unusual experience of feeling more blue than their shirts. Italy’s loss to Sweden on Monday marked the first time in 60 years the team didn’t qualify for the FIFA World Cup and, news flash, fans are not pleased. Reactions to the historic defeat ranged from sombre reflection to bitter outrage to all-out catastrophization. "Italy, this is the apocalypse," one prominent Italian sports paper declared on Tuesday morning’s front page. Another newspaper called it a "national shame." One fan told the Guardian, "This match mirrors our country, which is falling apart." Certainly, fans of European football are an impassioned lot, and many countries put a lot of stock in how their team represents them on that particular world stage. There’s a sense that a nation’s World Cup performance sets the tone for the collective cultural and social identity—their national pride ebbing and flowing in four year cycles with the success of their team. Brazil’s lopsided 7-1 home-turf loss to Germany in the last World Cup, for instance, was deemed a "humiliation," a "historic disaster" by local newspapers that showcased portraits of wailing fans. France’s poor performance in the 2010 World Cup—both in behaviour and athletic showing—was widely considered a national disgrace. In a meeting hours before France played its fateful match, the country’s sports minister, Roselyne Bachelot, reportedly berated the team, calling their performance a "moral disaster" and bringing some players to tears. Perhaps the most tragic example of extreme reactions to FIFA defeat is the 1994 murder of Andres Escobar, a Colombian player who scored on his own team during the 1993 World Cup—a mistake that later cost him his life. In Canada, home to 1.6 million people of Italian descent, the disappointment around the Azzuri’s loss, while perhaps not murderous, is just as real. "It’s a disgrace," says Rocco Curatolo, a Winnipeg-based barber who moved from Italy to Canada in 1960. "The coach should have been fired a long time ago," he snaps. "There’s too much politics involved," Joe chimes in, a friend of Curatolo’s who stopped by the barber shop to shoot the breeze and ruminate over the defeat. "It’s going to be a loss of pride [for our community]," Curatolo adds. For Cafe Diplomatico—which was packed on Monday and opened its patio in single-digit temperatures for the heartbreaking match—the next World Cup will be the first in the restaurant’s history without team Italia. "It’s crazy to think about it like that," says Connie Mastrangelo. "We have a lot of personal friends and family that come down for the Italian games, which always makes it a little more lively crowd," she says. "We’ll miss that this [coming tournament]." Not to mention, the restaurant’s sales typically soar about 50 per cent during World Cup months. Asked whether Italy’s absence next summer will hurt that generous revenue bump, the Mastrangelos were not especially dismayed. When they took over the business from Rocco’s father 20 years ago, they made a point of appealing to all soccer fans; not just Italian ones. "Our tagline is ‘Where Nations Unite,’ " says Rocco. Indeed, it didn’t hurt the business when Italy got knocked out in the first round last World Cup, he adds. "For the final game, Germany and Argentina, we closed out the street and added an additional 320 seats. You couldn’t find a spot in the restaurant." Even Italy fans are not likely to sit out this World Cup, even if they leave their jerseys at home. "It doesn’t matter," says Curatolo in his thick Italian accent. "I still have heart for the ball." Rocco Mastrangelo is in the same boat, but don’t expect him to be wearing his Azzuri shirt or praying between penalty shots. "I’ll watch, for sure," he says. 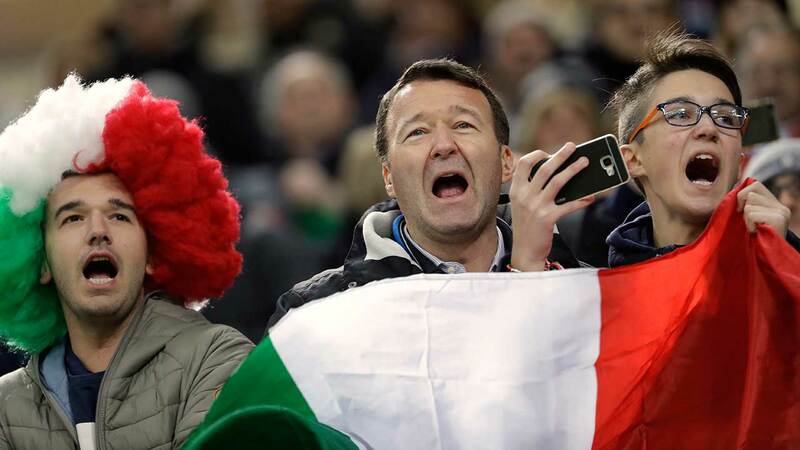 "But my team is Italy, so I’m not going to be, let’s say, very passionate about cheering on another team."